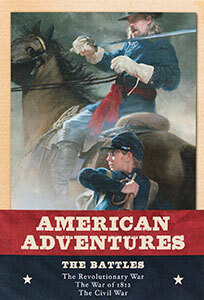 The American Adventures series features a trio of fictional stories highlighting moments in history, with content from the popular Tales of Young Americans series. The Battles contains three stories focusing on key American wars: the Revolutionary War, the War of 1812, and the Civil War. The first is The Scarlet Stockings Spy, written by Trinka Hakes Noble. The second is The Town that Fooled the British, written by Lisa Papp. The third is The Last Brother, written by Trinka Hakes Noble. Artwork by noted illustrator Robert Papp heightens the drama, bringing to life these rich chapters of American history.